Italian Ricardo Fraccari, president of the World Baseball and Softball Confederation (WBSC), arrived in Cuba to complete an intense work schedule that includes several meetings with local authorities of that sport. The distinguished visitor was received at Jose Marti International Airport by Higinio Velez, head of the Cuban Baseball Federation; and later in the Havana Sports City Coliseum by Martha Lidia Ruiz, Director of International Relations of the National Institute of Sports, Physical Education and Recreation (INDER by its Spanish acronym). 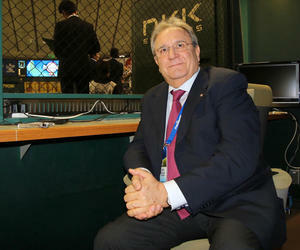 In the meeting, Fraccari said that after the inclusion of baseball-softball in the program of the Tokyo 2020 Olympics, he has visited different nations and witnessed how "global enthusiasm has been renewed for our sport." Fraccari and his companions will meet today with representatives of the Cuban baseball and softball federations to address issues related to the qualification process towards Tokyo 2020 and other WBSC projects. After that, he will be received by Antonio Becali and Omar Venegas, INDER president and vice president respectively, to then offer statements to the press. During his visit to INDER's headquarters he was accompanied by Velez and Antonio Castro Soto del Valle, WBSC's global ambassador.